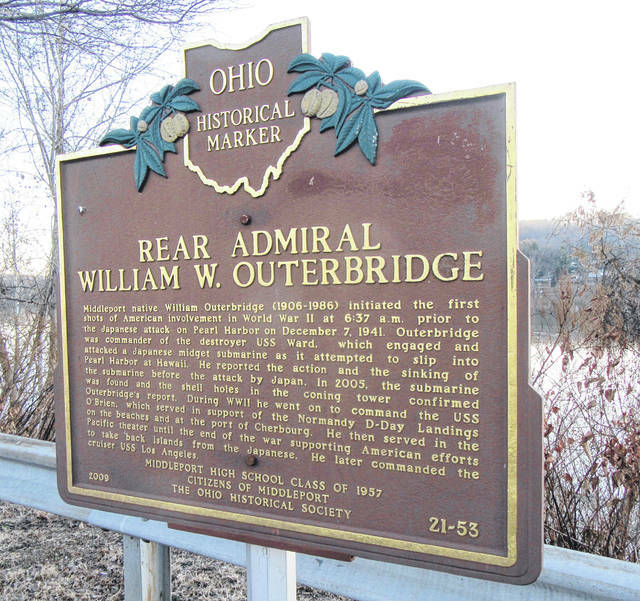 The marker at the top of the boat ramp in Middleport tells of Rear Admiral William W. Outerbridge. 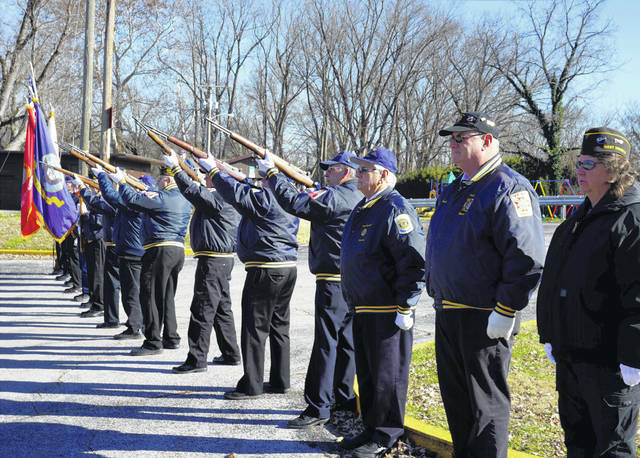 A gun salute marked the 77th anniversary of Pearl Harbor during a ceremony Friday at the Mason levee. The ceremony was held by the Smith-Capehart American Legion Post 140 of New Haven and Stewart-Johnson V.F.W. Post 9926 of Mason. MIDDLEPORT — Putting into action the vow to never forget, members of Feeney Bennett American Legion Post 128 conducted the annual Pearl Harbor remembrance ceremony on Friday morning. 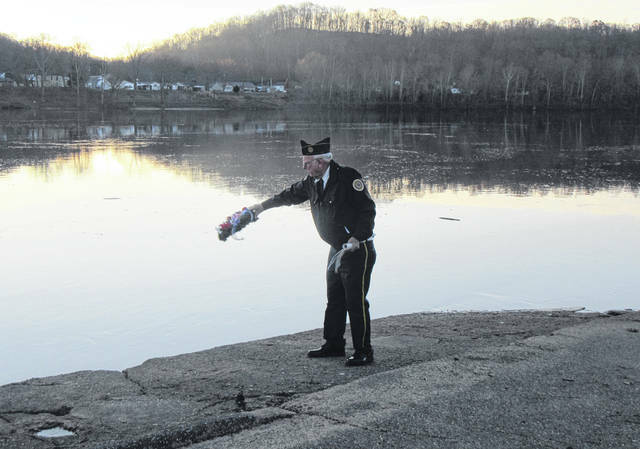 Each year on December 7, no matter the temperature or the weather, the Legion members gather at 8 a.m. at he Middleport boat ramp for a ceremony which includes a prayer, the placing of a wreath in the river and a gun salute. A ceremony was also held at the Mason Levee on Friday. Members of the Stewart-Johnson V.F.W. Post 9926 of Mason and Smith-Capehart American Legion Post 140 of New Haven gathered at the Mason levee at noon to hold a ceremony to remember Dec. 7, 1941, the entry into World War II. The placing of the wreath in the river as part of the ceremony is a tribute to those who lost their lives at Pearl Harbor 77 years ago on Dec. 7, 1941. The Japanese attacked the U.S. Naval base in Hawaii at around 7:55 a.m., propelling the United States into World War II. More than 2,400 Americans were killed at Pearl Harbor, and another 1,000 wounded. When attacks on Pearl Harbor and other military bases were over, more than 300 aircraft were damaged or destroyed, and 21 ships were sunk or damaged. Sentinel managing editor Sarah Hawley and Ohio Valley Publishing freelance writer Mindy Kearns contributed to this report.